Hello, Friends! You, know....you are just never too old to have fun! 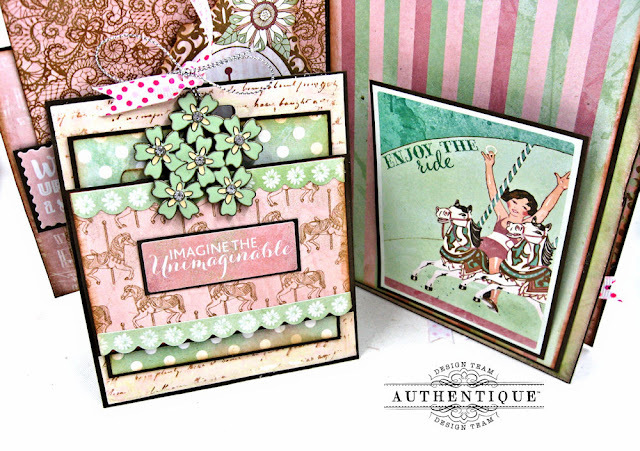 That's the thought that came to mind as I had a play date with the dreamy Imagine paper collection from Authentique. The colors, the images and the patterns took me right back to my childhood, and before I knew it, my little brain had hatched a plan for a trio of birthday projects. 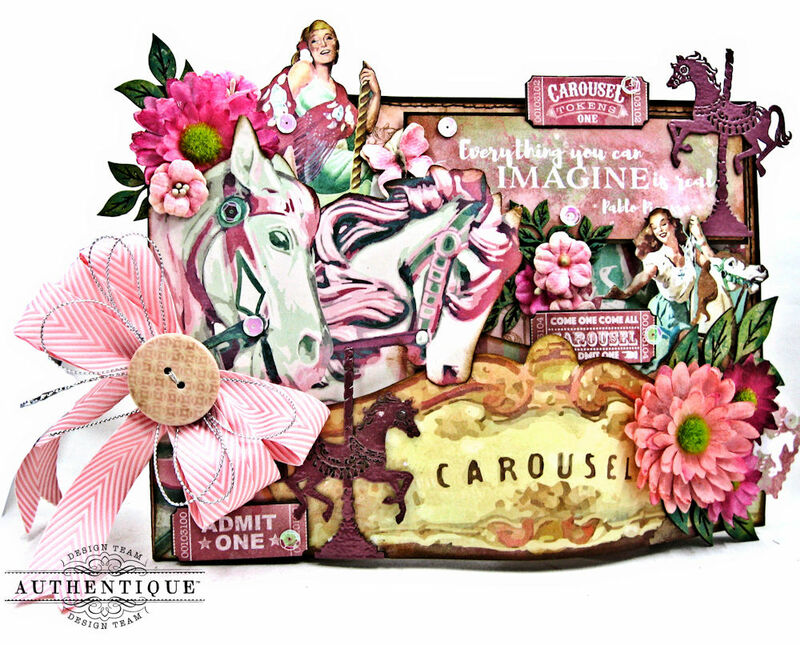 Now, this collection is great for kids, but I created this Carousel Themed Birthday ensemble for grown up ladies who might be celebrating a "milestone" birthday. I had so much fun making this large Bendi Card style centerpiece, quote wallet and folio. Let's take a closer look at each project, shall we? I admit it: I'm a sucker for a fancy fold card. I enlarged the dimensions for a standard Bendi card to make this Carousel themed Bendi Card Centerpiece. Isn't it fun? 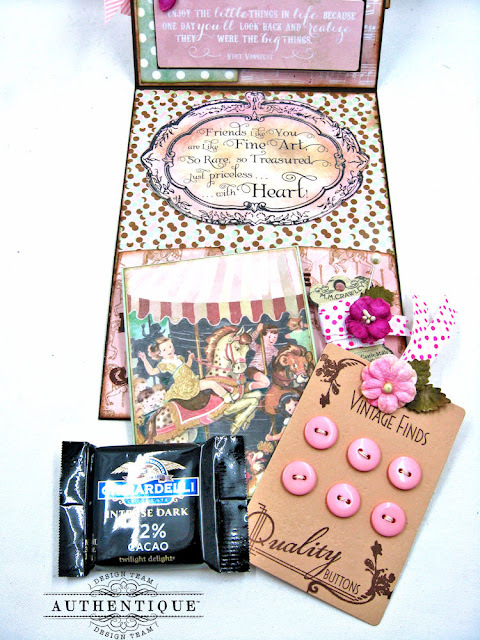 The centerpiece measures 8.75" wide x 6.25" tall. Loaded with layers and dimension, it's bound to get the party started. 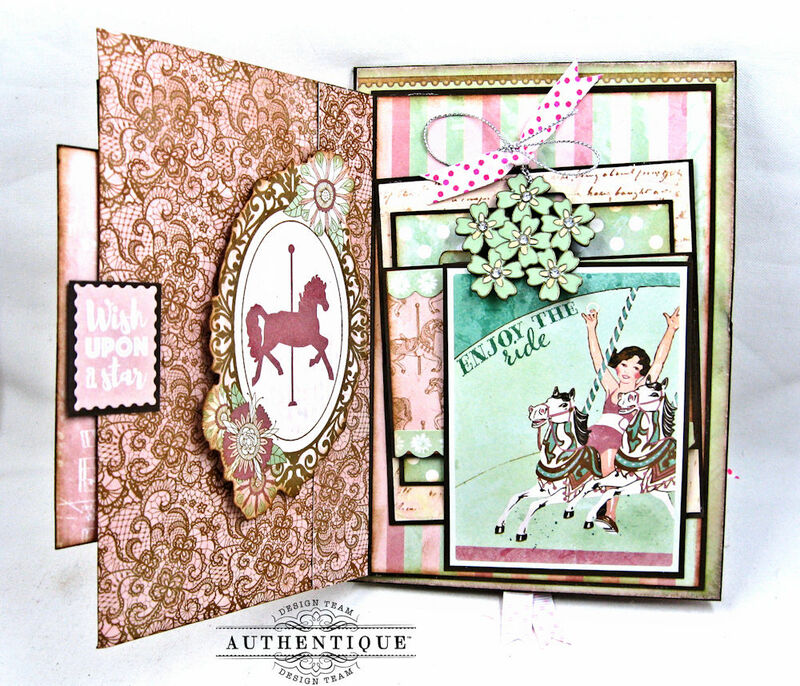 I fussy cut images from the 12x12 Imagine Collection Kit to create this fun design. And, I also put together a Snapguide Tutorial so that you can make one, too. 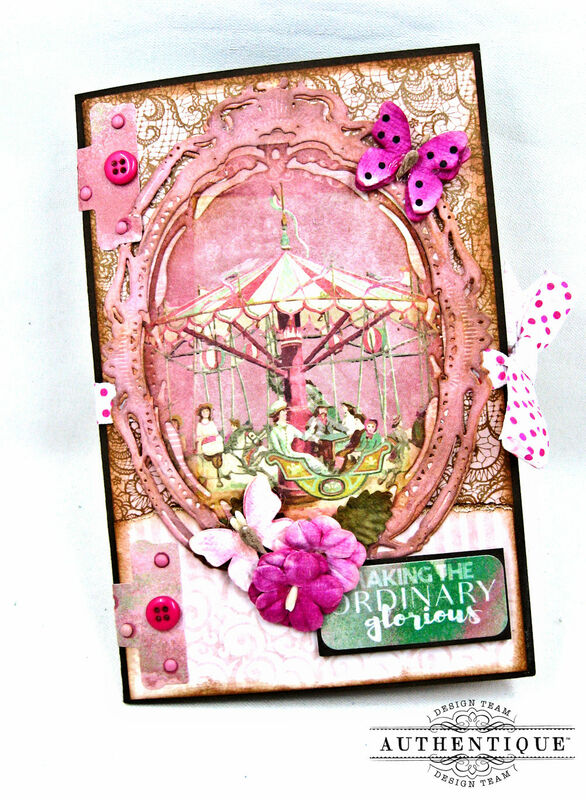 Check out How to Make a Carousel Bendi Card Authentique "Imagine" by Kathy Clement on Snapguide. The focal image on this card was the inspiration for this entire birthday ensemble. Seeing that white haired lady having the time of her life on the carousel make me think, "You're never too old to have fun!" Although this looks like a standard 5" x 7" top fold card, I built some sweet surprises into the design that make it function as a mini folio. I matted each layer with rich chocolate brown cardstock, then topped the layers off with this delightful image from the 12x12 cut apart page. 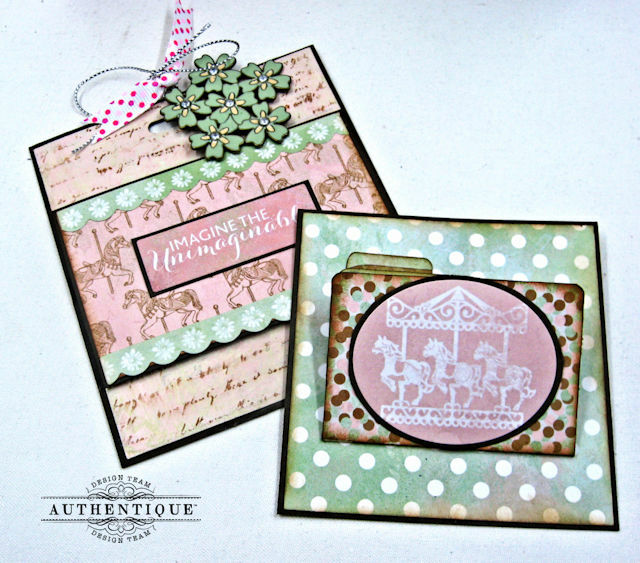 A little mixed media action dressed these chipboard numbers up and got them ready for the party. I simply painted the chipboard with Picket Fence Distress Paint, then tapped over that with Antique Linen and Tattered Rose Paints. 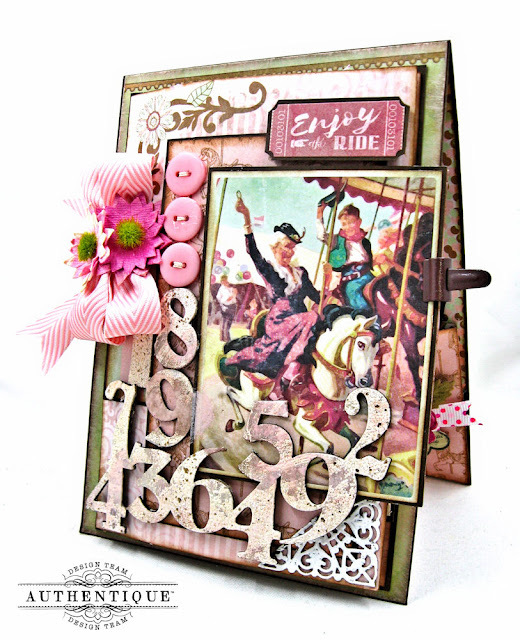 While the Distress Paints were still wet, I sprinkled the numbers with Shabby Ivory Embossing Enamel and heat set. 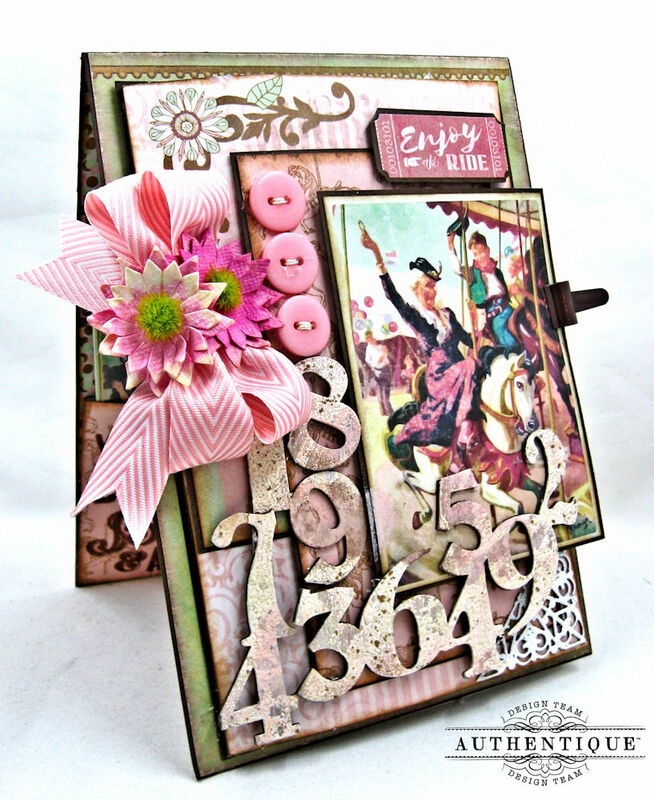 Toss in some pink buttons from my vintage button jar, a perky pink chevron bow, flirty pink Petaloo flowers and a matted sentiment sticker, and the cover is ready to party. Remove the little brown binder clip, and you will find that the front cover is hiding a little treat! I fussy cut the pretty carousel pony from the 12x12 papers to create a tuck spot where you can insert a little personal note or photo. 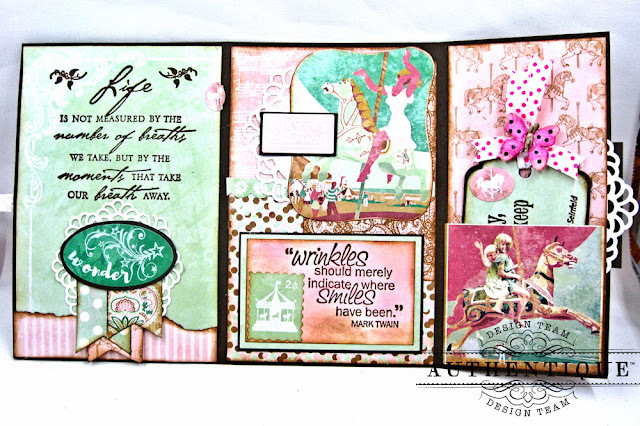 This image from the cut apart page is turned into a pocket by matting it on brown cardstock and then gluing just the bottom edge to the paper. I gave an old Petaloo flower tag a mixed media beauty treatment to create this sweet little tag. 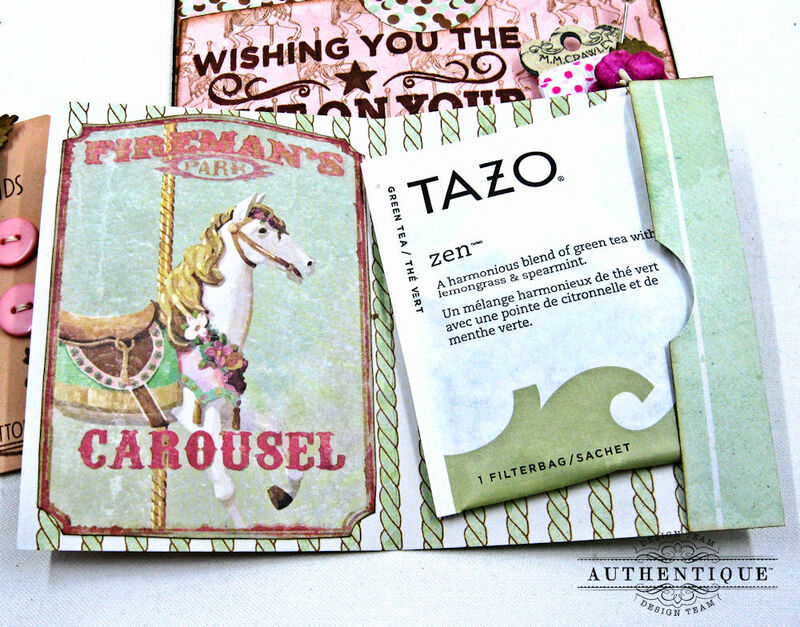 This little gift card holder slips inside the decorated belly band. Just slip your gift card or monetary gift into the file folder, slip it back inside the belly band and you're good to go! 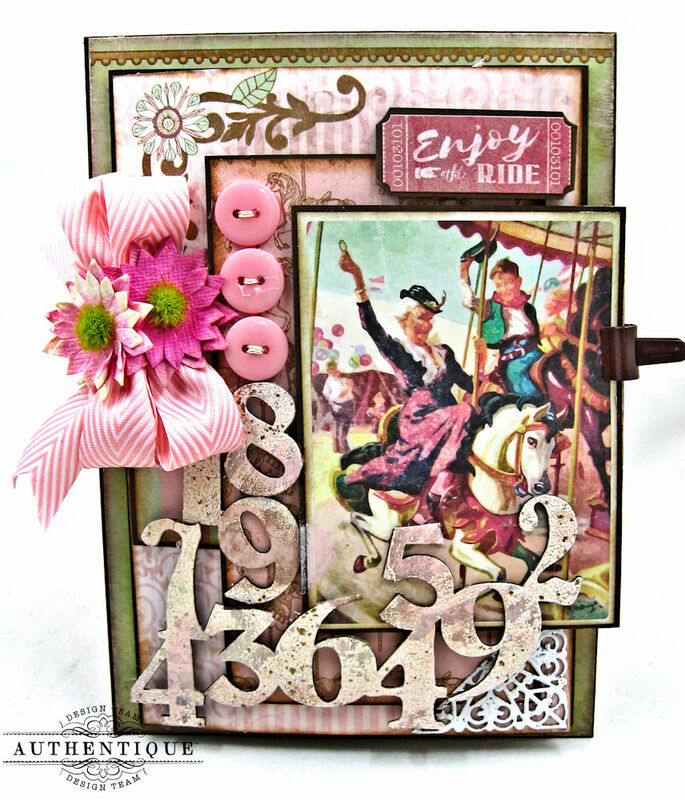 The tag makes a great bookmark, and it also is pretty enough to sit on a small easel. 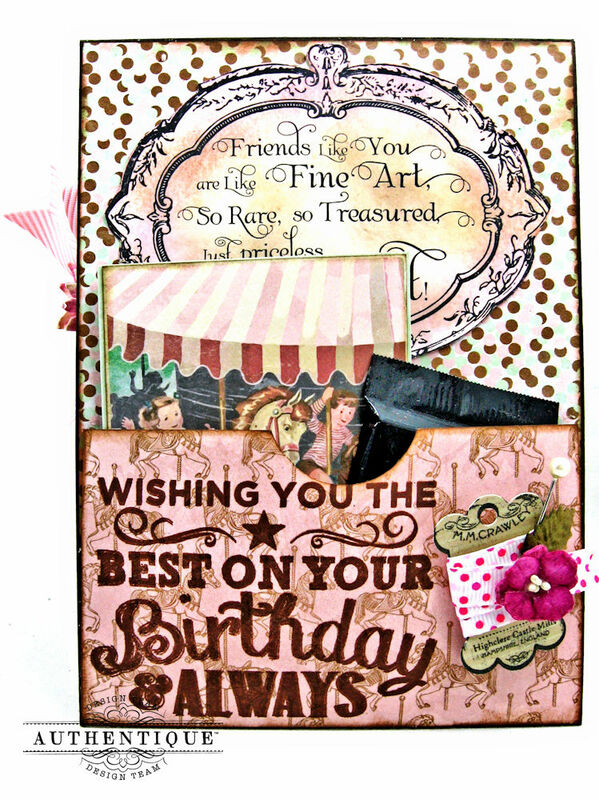 Now we lift the top fold flap to find even more birthday goodies inside the folio. 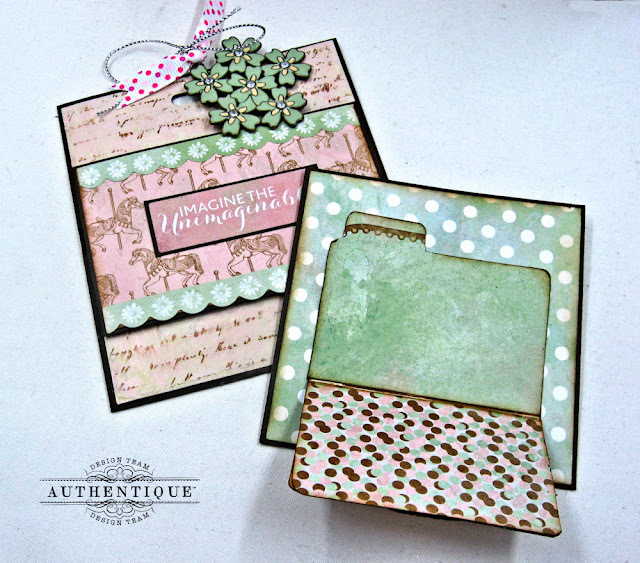 A handmade button card is tucked into the side pocket on the top of the card. This would be a great place to store photos from the birthday party, wouldn't it? But wait, there's more! The bottom pocket is hiding some sweet surprises as well. Here's a better look at that vintage button card. And you can see I've tucked in an individually wrapped chocolate, because...well, it IS a birthday card, after all! I also made a sweet little tea bag holder. Growing older isn't so bad when you get to open so many fun treats, is it? This 4" x 6" quote wallet is filled with good thoughts about life and birthdays and growing older. It's a fun tri-fold design, decorated with gorgeous papers and details stickers from the 12x12 Imagine Collection Kit. 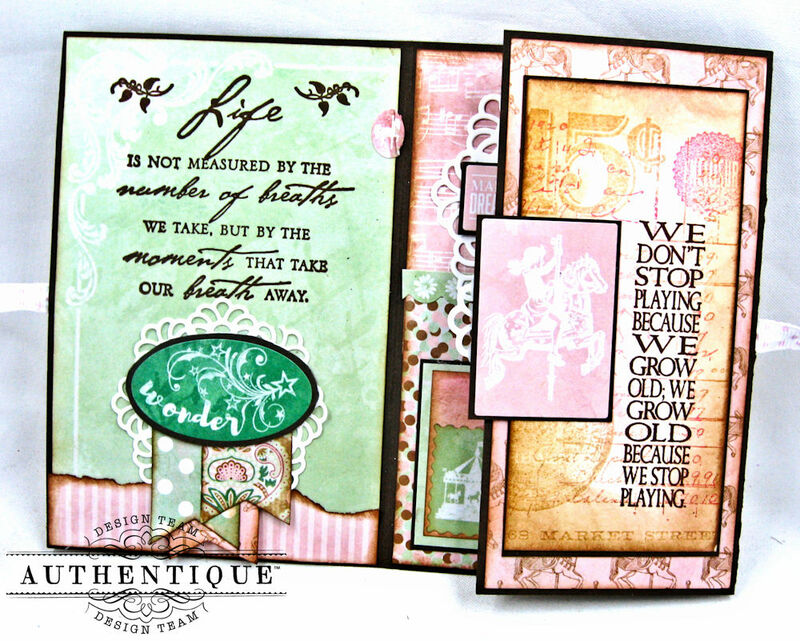 I inked up some of my favorite sentiment stamps with Coffee Archival Ink and added them to the quote wallet. 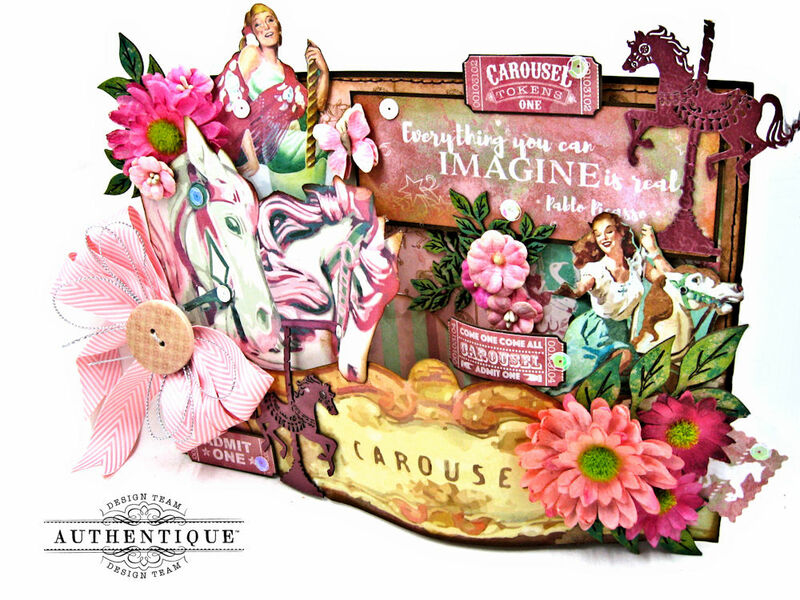 I never throw away even a scrap of gorgeous Authentique papers. Even little snippets can be turned into pretty banner flags like the ones beneath the "wonder" sticker. 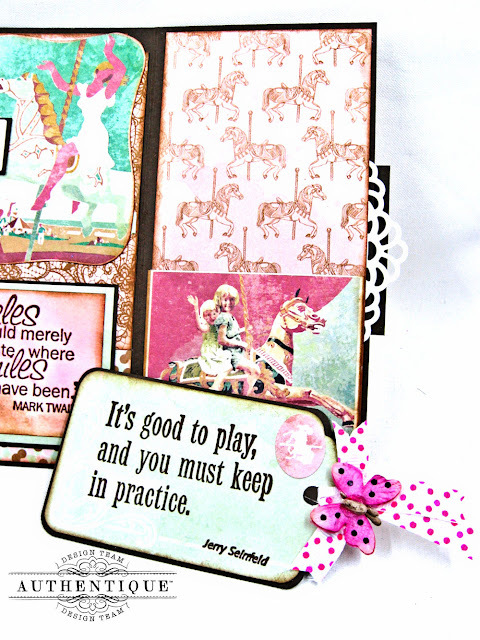 I trimmed this image from the cut apart page to fit the flap of the quote wallet. Then I turned it into a pocket by adding 1/8" scor-tape to the bottom and sides. The little tag inside the pocket is made by cutting a small rectangle of Imagine paper to fit the pocket. Then I just rounded the corners with a punch, and added a scallop to the top with another punch. This is a great quote, isn't it? I prepared a YouTube Video tour of these projects for you as well. 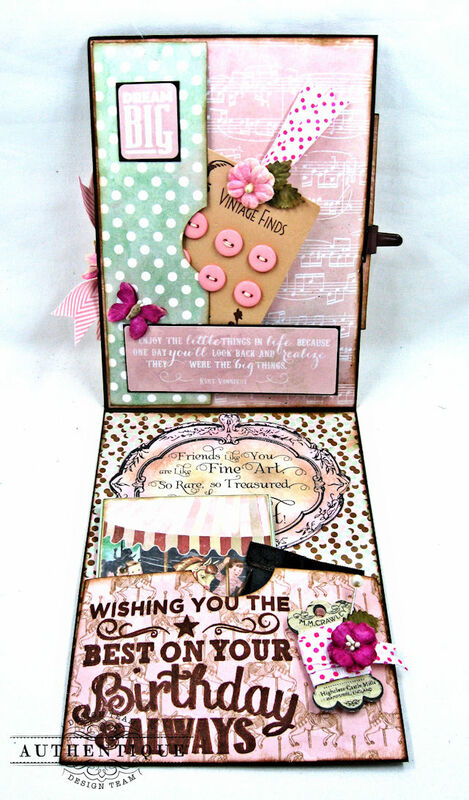 You'll find lots of tips and tricks in it that you can use in your own crafty adventures. Thanks so much for letting me share these fun projects with you. 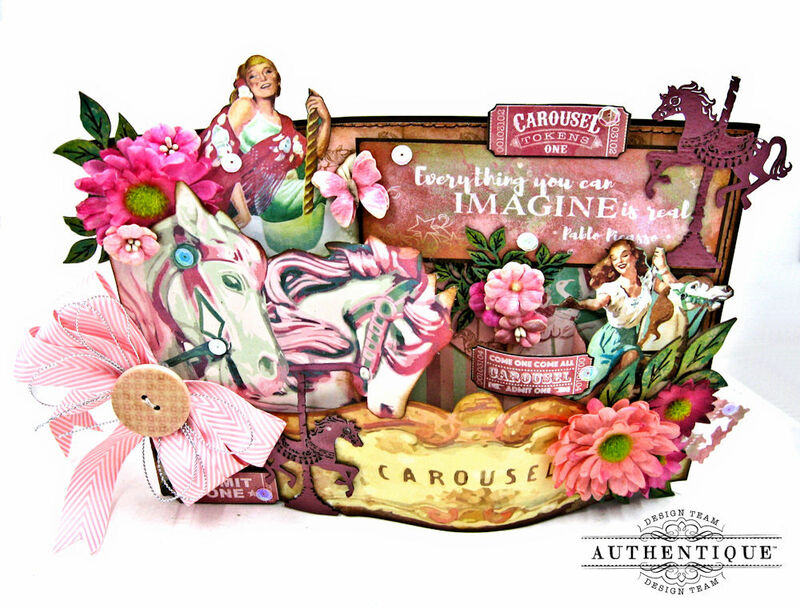 I hope I've inspired you to get out your Authentique papers, scissors and glue and get your craft on! 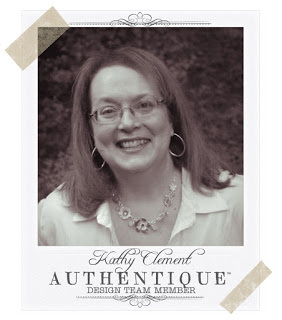 Stunning projects, Kathy! I totally NEED this paper collection!!! Thank you so much, Gloria! 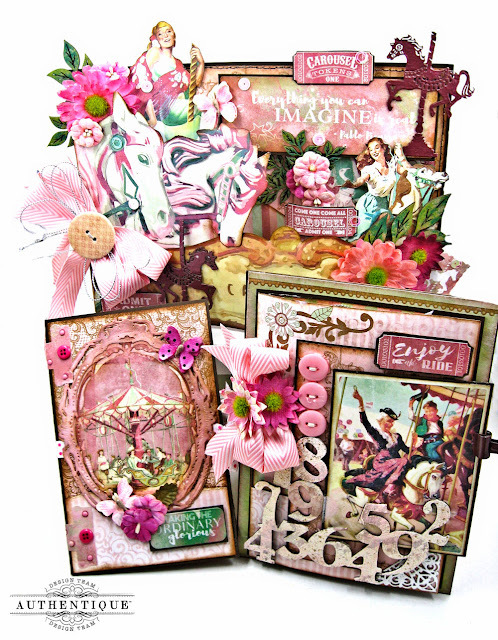 It's a dreamy collection...I barely scratched the surface! OH my gosh!! Am so impressed with its beauty!! You do such fantastic details and layering! !